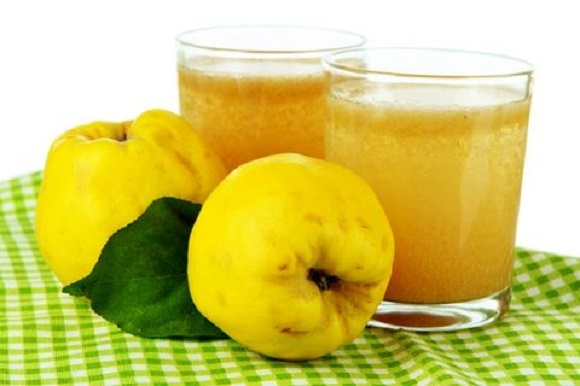 Quince juice is a great drink which was prepared by our grandmothers. It brings the taste of some ancient times when our ancestors were facing nature. Today, this drink is becoming again popular because it is well known that it is beneficial to human health. Quince in its raw state does not have pleasant taste although some prefer to consume it like that. On the other hand, when processing it, it gets a very rich note that you will not forget. The most beautiful is when it is prepared as a beverage. Below we tell you more about how good the juice is and in what ways you can take advantage of this fruit. Quince is a plant of a very pleasant smell and belongs to the family Rosaceae, which includes apples and pears. Originates from warmer regions of Southwest Asia, and the fruits are produced in autumn and winter. When they mature, they are golden-yellow in color and the shape is reminiscent of their two cousins ​​that we just mentioned. The only thing that is different is bark, which looks more like a peach, while meat contains a large amount of seeds. Due to its specific taste, quince fruit is not pleasant to be eaten in its raw state. This is because it is acidic and a little harsh, and most people are not fan of its taste. However, this should not discourage you as this is an indication that it is full of useful substances. Quince juice and apples is something completely different, and it is rare that someone does not like this beverage. Like most similar fruits, quince is rich in vitamins A, B and C. There are also significant for the fact that they include plant fibers. It also has a lot of minerals, so potassium, copper, selenium, zinc, phosphorus, calcium, iron and magnesium are present. All this makes a phenomenal combination that has a very positive effect on our health. How and in what way - learn in the following lines. Ripe quince is rich in vitamin C, so one fruit meets about 25 percent of the daily requirements. It also helps strengthen the immune system, and particularly affects the prevention of inflammatory processes. Also, it is known that it has anti-allergic properties, and the extract of seeds is used to treat dermatitis and cysts. When it comes to quince juice, calories are present in very small quantities - only 57 kcal per 100 ml. On the other hand, this drink is full of dietary fiber, which has a beneficial effect on digestion. It is therefore recommended as a natural remedy for weight loss. People who have problems with digestive organs, should definitely try this drink. It is known that it is effective against ulcer, and also reduces the amount of acid and eliminates heartburn. This drink is good and to remove the symptoms of morning sickness. It is also good to drink it against diarrhea, constipation or persistent intestinal infection. For centuries is known how this fruit fights against viral diseases, and is the perfect ally in autumn and winter. The quince has an abundance of vitamins defending against flu, colds and inflammation of the airways. Since it is rich in potassium, we can safely say that the quince juice is great for the heart. Especially when it comes to the fight against high blood pressure, because this beverage keeps it under control and within normal limits. In addition, it reduces the level of bad cholesterol, which is definitely a positive effect on heart health. Thanks to antioxidants, this fruit helps your body to eliminate toxins and free radicals. The tannin is present in quince, which can effectively fight cancer cells and prevents them from spreading throughout the body. It turned out that it is useful to drink quince juice against colon cancer. It has a positive effect on the mucous membranes of the digestive system and protects against this terrible disease. The Chinese have long recognized its medicinal effect, but this fruit has a special status in Balkan countries. In particular, it has been known to that preparations with quince have been used for regeneration and detoxification of the liver. It also has a very positive effect on the vision. Since it contains iron, potassium and copper, this fruit is a natural ally in the fight against anemia. It is useful to drink the juice for anemia, because in a short time it will recover and invigorate your body. Medicinal syrup stimulates red blood cell production. Fruit thoroughly wash under running water and put it in a jar. All of them grate one board and leave it a little. In a separate saucepan mix sugar and water, and put it on the fire to cook. When the mixture begins to boil gently, put grated quince. Stir a little until well combined and remove from heat. Cover the pan with a cloth and leave it overnight in a cool place. In the morning mash this mixture, and a liquid that is created pour in a separate pot. Let it boil on the fire. After that, pour clear juice in bottles that you have previously warmed and close them well. Store in a dark and cool place and drink diluted with water at a ratio of 1: 3. Fruit trees and wash and together with the skin cut into slices. Throw them in a pot, cover with water and cook over high heat until it boils. When soft, remove the pan from the stove-top and let it quite a bit cool. Insert them in the blender and mix and then again put it on heat. Add limuntos and sugar, and stir constantly until all is melted and blended. When finished, pour the juice in glass bottles. Close and wrap it in a cloth and leave it to cool for a while. Quince juice from a juicer and or made according to the present recipe can be drunk without dilution with water. You can spice it up with a little mint if desirable. First, wash the fruit, cut them into slices and cook in a saucepan in which you poured 2 liters of water. In a separate saucepan pour a liter of liquid, and in it the same way prepare carrots. When these ingredients are ready, mash them and unite in a larger pot. In it, then add 12 liters of water, and with constant stirring pour limuntos and sugar. Cook for about twenty minutes to make it unite well. Once complete, pour into a glass bottle, seal and wrap in a cloth. Let it cool. As in the previous case, this drink is consumed without dilution with water. What will certainly delight you is that you can make a delicious homemade sweet specialty that is very healthy. We will share with you a recipe for stewed quince for the winter, which is very simple. You will enjoy the preparation as well as consuming it. In a saucepan pour a liter of water and add limuntos and lemon cut into slices. Quince thoroughly wash and peel the bark, and dip them in the solution in order not to change color into black. Then cut into slices and put the slices into clean glass jars. Add lemon along with fruit and finally insert three tablespoons of sugar and pour water to the brim. Close the jars, put them into a larger bowl and cover with water, and let them stand for 20 minutes on a strong heat. Then remove the top and leave them to cool down. The next day, store in a dark, cool place. This beverage is quite safe and is recommended to anyone who wants to strengthen the immune system in a natural way. There is no indication whether it causes side effects, and the only thing you need to avoid are the seeds that contain cyanide to some extent. Quince juice in pregnancy can be consumed, but moderately with prior consultation with the doctor. It will certainly help to compensate for deficiencies in iron, which is common in women during those nine months. You will enjoy its taste and it will do a lot more for your health. This delicious fruit is the perfect food that will enhance and provide your body with much needed vitamins and minerals. What will be particularly appealing is that it goes well with many desserts. Protect and strengthen your health and enjoy a beautiful taste that quince juice has to offer. If you like it you can make a domestic compote, with it you cannot make a mistake.